Your exhaust system relieves pressure created by your engine’s combustion process. The pipes draw spent gases and hot air away from the engine and dispose of them safely. This limits the stress on the internal metal components. The exhaust pipes also contain all of the poisonous vapors created by burning fuel. Repairing a leaky car muffler or exhaust manifold keeps you safe and restores the performance of your engine. Custom and aftermarket exhaust systems further reduce inefficiencies in the original design to increase the available power output from your engine. 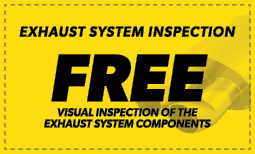 If you think your engine’s exhaust system could be improved, ask one of our technicians at our Meineke #157 in Darby, PA, to evaluate your vehicle. When a muffler goes bad it is usually pretty noticeable. As its name implies, one of a muffler’s jobs is to muffle the sound created by the combustion process, which is a series of explosions. This process is extremely loud, so when your muffler is not performing correctly, the noise from your vehicle may increase in severity. Another clear sign of a bad muffler includes an increase in smelly gas in and around your vehicle. If there is excess backpressure in your muffler and exhaust system, it could push the exhaust fumes into your vehicle's cabin. Because some of these fumes are harmful and potentially deadly, it is imperative that you take your vehicle to Meineke #157 in Darby, PA, for repair as soon as you suspect there is a problem. A high-performance exhaust system for your car plays an essential role in the proper operation of the vehicle. When your car engine runs, fuel combustion naturally creates harmful gases. The performance exhaust system expels those gases from the car and keeps them from entering the interior. It also controls the emissions and amount of pollution released into the air while quieting engine sounds. It is important to fix a leak in high-performance exhaust systems as soon as it is detected because leaks can affect your car's performance. Visit your local in Darby, PA, to have your exhaust system checked out. A catalytic converter is a commonly overlooked item on a car. This component is located inside of the exhaust pipes. It reacts chemically with spent fuel vapors that pass through it and completely burns away pollutants before they reach the outside air. Manufacturers are required to warranty these components for only 80,000 miles. While necessary, catalytic converters also restrict the efficient flow of air through an engine, which can minimally reduce the power output. High performance exhaust systems overcome this limitation, and many aftermarket exhaust components enhance the original design. Replacing worn out catalytic converters and installing custom exhaust systems are complicated jobs. Contact our in Darby, PA, to see what we can do to improve or repair your vehicle. The best muffler shop for your vehicle in Darby, PA, is Meineke #157. Our friendly and professional mechanics are custom exhaust experts. They can get your vehicle back in tip-top shape in very little time. We know that muffler repairs can be an unwanted expense, but you can’t afford to drive your vehicle around with a bad exhaust system in place. Along with equipping your vehicle with a performance exhaust that is tailored exactly to your vehicle’s specifications and use, we offer you the most competitive pricing around. Bring your vehicle in today for one of our quality performance exhaust systems for cars and experience the savings.